Minarik Drives' RG510UA is a full-wave, four-quadrant regenerative SCR drive that provides smooth motoring and braking torque for brush-type DC motors ranging from 1/20 through 1/2 HP, for a single or bi-directional variable speed, without using mechanical contactors. 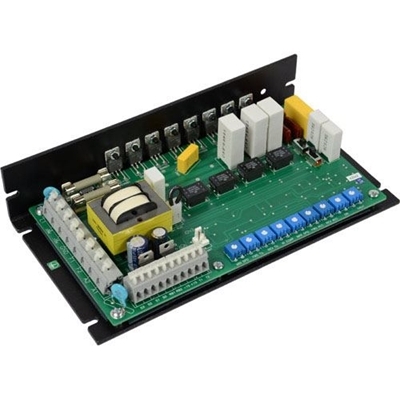 Slide switches allow the RG510UA drive to accept a 115 or 230VAC input to run 90 or 180VDC motors. The tach feedback mode virtually guarantees constant set speed under a varying load. Applications with overhauling loads, rapid deceleration, basic positioning and high duty cycle reversing and braking benefit from this versatile regenerative drive. 4Q Reversing: Regenerative/4 Quadrant drives have the ability to perform quick, contactorless reversing on-the-fly! Speed range and regulation: 1% regulation over 50:1 speed range. 0.1% regulation over 60:1 speed range with the addition of a tachometer for feedback. User adjustable calibration pots: IR compensation, forward torque, reverse torque, tachometer, min speed, max speed, forward acceleration, reverse acceleration and deadband. Cage clamp terminal block: Quick and easy wire terminations. On board fusing: No need to add external fusing for protection of your motor or drive. Additional features:Dual voltage AC input, switch selectable armature or tachometer feedback mode and field supply for shunt wound motors. Options and accessories: -PCM option adds Burr Brown isolation, 201-0024 inhibit plug for regenerative brake option, 200-0386 limit switch logic board and DLC600 digital controller.